Child: "Is it okay for me to [enter ridiculous dangerous request here]?" Child: "Mama, are you eating something?" Child: "Mama! You're eating from the treat bags again, aren't you!" So next week I am participating in a holiday blog hop in which we blog about a different holiday topic each day. I love blog hops because I love reading blogs and it is so fun to see what everyone else does for the holidays. Problem is, I don't really think we do anything that others are going to think is blog-worthy. We don't go all out on the decorating, and I don't make thousands of holiday goodies to share. Even gift giving is pretty basic around here. I hope I am inspired over the weekend with some brilliant spin on our Christmas. It's safe to say our homeschooling year is in full swing, but I am just not enjoying it as much as in past years. Homeschooling is a ton of work and takes several hours a day to complete. As a result, my house is a disaster, we are always out of essential food items, and my nineteen month old acts like a wild barbarian. How do moms with a gazillion kids actually succeed in this endeavour? Well, I have four kids literally hanging on the back of my chair eagerly awaiting their education. It'll have to be five takes this week. 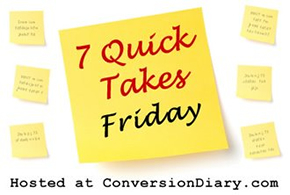 Check over at Conversion Diary to read folks that actually put full effort into this week's Quick Takes. 2. Kid snippets is my favorite. And math class goes just! like! that! at my house, too. 3. Looking forward to following your holiday blog hop! Maybe it'll keep me off Pinterest, trolling for holiday ideas. I love your ending. That's so real! It made me chuckle. At least they're eager, right? Oh my, that little video has me in stitches!!! It seems if we have a good homeschooling day, the house is a mess. If the house gets cleaned, the homeschooling was a mess. I can't seem to do both well on the same day!